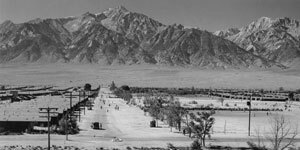 Today, March 21, 2012, marks the 70th anniversary of the arrival of the first prisoners at Manzanar, a concentration camp in southern California. Grace Ito Coan, a member of Sacramento Friends Meeting, was among the U.S. residents of Japanese ancestry imprisoned there from 1942-1945. I wouldn’t have noted this day if not for Grace’s story, “Manzanar: Forever in the Past?” in the current issue of Western Friend. Her account put a personal face on a sad and painful time in U.S. history. Manzanar was the first of ten camps authorized on February 19, 1942 when President Franklin Roosevelt signed Executive Order 9066. 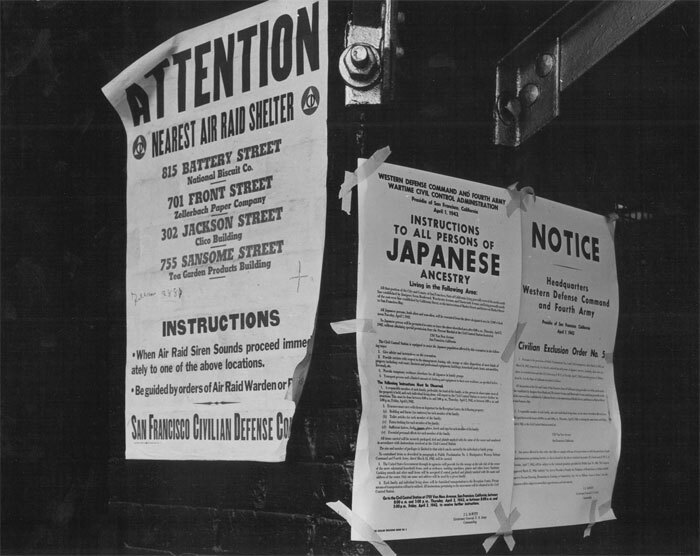 This action, in response to Japan’s attack on Pearl Harbor, moved nearly 120,000 Japanese and Japanese Americans into isolated relocation centers in Arizona, Arkansas, Colorado, Idaho, Utah, and Wyoming as well as Manzanar. Often with less than a week’s lead-time, people were ordered to the temporary, tar paper-covered barracks. Grace describes, “…dust seeping through the knotholes and cracks. We were to sleep on metal cots, and we filled our mattresses with straw.” She and thousands of others were forced from their homes, businesses, and communities simply because they were of Japanese ancestry. Nearly three-quarters of them were U.S. citizens. I live on a thirty-square-mile island with about 2200 people. I try to imagine five times that number squeezed into an area about the size of our village center. I can’t. But Grace’s story in Western Friend and many more stories and images of Manzanar at a National Park Service website bring attention to a shameful time in history. Although these imprisonments occurred years before I was born, I’m embarrassed by my limited knowledge of them. It wasn’t until I moved to Seattle and started attending University Friends Meeting (UFM) that I learned more of this history. One of UFM’s founders, Floyd Schmoe, among others in the Meeting, kept these concerns before us. Schmoe’s son-in-law, Gordon Hirabayashi, had defied the government curfew and evacuation orders, calling them a gross violation of Constitutional rights. He was arrested, convicted, and imprisoned, and eventually appealed his case to the U.S. Supreme Court. Although the Supreme Court initially upheld his conviction, efforts to overturn it resumed in the 1980s, culminating in his judicial vindication in 1987 and redress for the victims of internment. Hirabayashi died earlier this year at age 94. Each year, over 1,000 people from diverse backgrounds, including students, teachers, community members, clergy and former incarcerees, make a pilgrimage to Manzanar to commemorate the unjust imprisonment. This year’s pilgrimage also marks the 20th anniversary of the establishment of the Manzanar National Historic Site. Dr. Mitchell Maki, the lead author of Achieving the Impossible Dream: How Japanese Americans Obtained Redress, will give a keynote address on the topic, “Why Remember?” Grace’s story and her urgings that we remain vigilant so Manzanar never happens again give ample reasons to remember. The Western Friend article moved me to honor this anniversary. The word anniversary is from the Latin anniversarius ‘returning yearly,’ from annus ‘year’ + versus ‘turning.’ Today, I’m turning my thoughts to Manzanar and Grace.